#GirlChampion Competition Sponsored by British Deputy High Commission. The International Day of the Girl Child. This year, we're including boys as well as girls in the call for girls education with a competition that will see 12 lucky kids win exciting opportunities, including being hosted to tea by the Deputy High Commissioner in Lagos. 1. Record a 120secs video on what career they would like to pursue & what global need it will help to meet. 2. Make sure you include your name, Age,Level of Education. 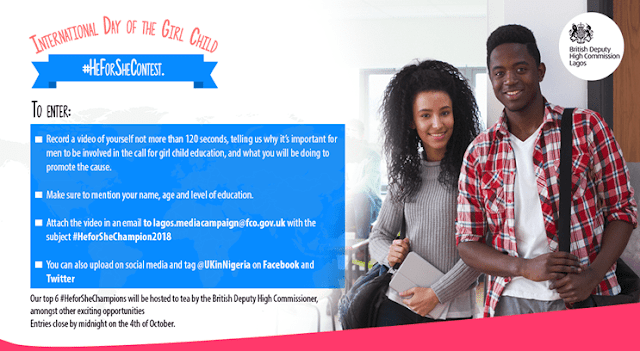 3.Attach your Video in the email to lagos.mediaccampaign@fco.gov.uk with subject #GirlChampion2018. 4. You Can also upload in our social media Facebook or Twitter @UKinNigeria. Entry closes midnight 8th October, 2018.